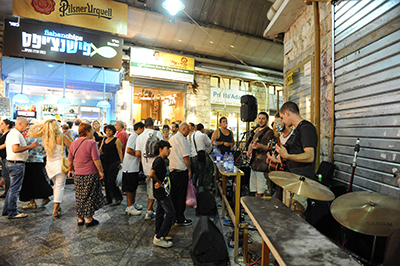 Musicians perform at the Mahaneh Yehuda market at night. photo by Moshe Milner/Israel National Photo Collection. There is a time of day when the shuttered stalls and dark alleys make Jerusalem’s outdoor marketplace look like a film noir set. You startle at every shifting shadow in the deserted shuk and quicken your pace to escape the unsettling sound of creaking tin rooftops. When I lived in Jerusalem, that hour came around dusk. That’s when the hawkers and vendors of Mahaneh Yehudah closed their stalls, spewing out a sea of shoppers whose exodus turned the colorful and cacophonous hub of the city into an eerie, empty maze. So it came as a surprise to discover that in the two decades since I had left the city, the shuk had been transformed into a nocturnal creature of sorts—one that still winds down at dusk, only to spring to life again with a vengeance late at night. Equally surprising to me was the discovery that I, who had in the meantime traded a dynamic city life for sleepy suburbia and youth for middle age, could—in this infectious and inviting atmosphere—also spring to life, even after midnight. I had been having coffee at the home of a friend in Jerusalem who told me about her son’s new venture, Jerusalem Nights. For a fee, Ezra Rabin, a 25-year-old university student, personal trainer and former combat soldier, would take young tourists to several of the best pubs and bars around town, the ones only locals know about, particularly in the shuk. There they would get a chance to imbibe Jerusalem’s burgeoning nightlife scene, VIP-style. Nice idea, I piped in. If I were 20 years younger, I’d tag along. “Me, too,” my friend concurred, both of us wistfully recalling bygone nights. I think I was the one who suggested we ask Ezra, jokingly, if he’d consider doing a “senior citizens” night out on the town. A week later, there we were: more than 15 of us—men and women in their 40s, 50s and north, a mix of folks from Jerusalem and Modi’in, Austin and Boston, and a few other locales. We were a group of parents (including Ezra’s own) and quite a few grandparents. Between us, we probably had enough offspring to fill an alleyway in the marketplace. We set out a little after 9 P.M. on a pleasant summer evening, winding our way through the nooks and crannies of the shuk. Though the stalls were shuttered and padlocked, there seemed to be a steady stream of people. On my own, I would never have found my way through this labyrinth of alleys to our first destination, a cozy little bar called Hashchena (The Neighbor). The bartender, Ron, greeted us warmly (in English) and told us about the establishment, founded in 2014 by several Jerusalem friends as a neighborhood hangout. Ron pointed out the exhibit—portraits of various celebrities painted by art students from the Bezalel Academy of Arts and Design—then graciously plied us with sublime limoncello, made on the premises. I was interrupted just twice with “urgent” calls from home—where had I left the tablet and had I fed the dog?—after which I was able to fade blissfully into a haze of lemony booze and banter. Just as we were forming fast friendships in our little group, Ezra nudged us out of Hashchena and led us, pied-piper like, toward the sound of Middle Eastern music wafting through the passageways until we reached its source: Tahrir. Named after Tahrir Square in Cairo, this place is a nod to Middle Eastern culture. By day, it’s a marketplace stall, specializing in spices and herbs like cardamom, fenugreek and za’atar. But, after sunset, when the aroma of exotic spices has long faded, Tahrir deftly converts itself into a venue that offers other staples of the Middle East, namely the region’s food, drinks and music. This is no small feat given that the stall is about the size of a tiny bathroom. Customers never set foot within. Instead, they are served at tables and chairs set up every night in the lane. The stall doubles as a kitchen-bar where staff serve up Taybeh, a a beer from a West Bank Palestinian brewery; rosetta, a cold almond drink; and, of course, arak, the anise-flavored favorite, along with “Mama’s hummus” and variations of kubbeh, a Middle Eastern dumpling—to name just a few offerings. Meanwhile, a medley of Middle Eastern music—ranging from remixes of classic tunes to trendy new groups—plays, with local bands and singers performing live a couple times a week. To complete the tableau, there are backgammon sets and flavored tobacco hookahs. Sitting in this dimly lit alley schmoozing to the sound of an oud, I thought to myself how removed this was from the sterile nightlife most of us, including the Israelis among us, had known in our native cities. My thoughts were interrupted by a commotion down the alley. I strolled over to see a small crowd gathered around two young barefoot women swirling and shimmying to the sounds of Middle Eastern fusion playing from a boom box. They moved with the ease and agility of professional dancers, captivating observers. But they were not there to perform—they were just out having a good time and were determined to make sure everyone else did, too. Soon they were beckoning people in the crowd to join them. My friend, Sharone, a dancer herself, didn’t hesitate, going off with one of them. Then one of the dancers extended her arms toward me. My glance shifted left and right, but she silently indicated that, yes, she meant me. She took hold of my hands and yanked me toward the cracked stone tiles of the shuk that had become an improvised dance floor. And so, under the influence of a bit of limoncello, equally intoxicating music and a summer breeze, I was soon swaying sinuously. I completely lost track of the hour, but at some point Ezra signaled that it was time to move on. The two dancers hugged me and each of the others who had joined them on the “dance floor.” As we left, I looked back to see their swaying forms receding into the shadows. After one more bar stop, I felt satiated in every sense and, around 1 in the morning, ready to head home. There was just one problem: I couldn’t find the lot where I had parked. Ezra dutifully accompanied me while I searched. We finally found the parking lot—shuttered and locked. Who knew that lots in Jerusalem close at 11 P.M., even though the reveling goes on hours longer? Carless, I had no choice but to stay overnight in Jerusalem. Ezra generously invited me to stay at his parents’ house, where he lives. They had been part of our adventure but arrived home well before we did. When I first envisioned a night out, like in the days of yore, I hadn’t meant it literally. But here I was the next morning, feeling a bit like a university student again, having pulled an all-nighter and woken up on some friend’s sofa with a slight headache and a light heart. By now the shuk vendors would be opening their stalls and setting out their wares, the aroma of spices wafting through the alleys, luring the first shoppers. As for me, I would soon be heading back home to Modi’in to throw together a meal, cajole children to do homework and get my own work done. I had discovered the shuk’s dual existence—one thing by day, quite another by night. Better yet, I had rediscovered my own. Leora Eren Frucht is an award-winning journalist who lives in Israel. My husband and I will be traveling with a group of friends to Israel next month. I’d love to reach out to Ezra about arranging a late night tour of Shuk tour, if you don’t mind sharing his contact info.